Treasury and Finance Minister Berat Albayrak is pictured before an interview with Reuters in Istanbul, Sept. 2. The appetite of international investors for Turkey will continue to increase as soon as the government commissions the phases of the new economic era, Treasury and Finance Minister Berat Albayrak said. "With our multidimensional economy program, Turkey will continue to increase its confidence in investors," Albayrak said in an interview with Kriter, a paper published monthly by the Political, Economic and Social Research Foundation (SETA) think-tank. The minister elaborated on the recent developments in the economy, including the recent fluctuations in the exchange rates, measures and mechanisms the government aims to put into action in the upcoming period, the global economy's new era of protectionism and its opportunities for Turkey and the importance of healthy communication with markets and foreign investors and their view on Turkey. Speaking of the recent developments in the economy, Albayrak particularly emphasized that the Turkish economy was on target due to political reasons. Commenting on the recent mobility in the exchange rates, the minister said a serious structural problem in the markets, a significant deterioration in macro indicators or a major political crisis must be in place for a change and fluctuation in exchange rates to take place at this rate. He stressed that in contrast to the negative indicators, the transition to a more dynamic and effective management mechanism and a strong structural transformation process is emerging in Turkey with the new system. "There is no negative change in Turkey's macroeconomic indicators. On the basis of this process, we see political factors rather than economic ones. 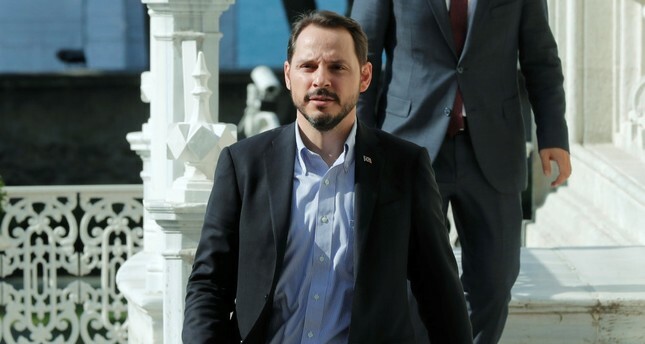 This kind of mobility in a period when there is no economic practice that negatively affects market actors shows that they are trying to apply a political agenda that involves a devaluation of our currency and destabilization of our country's markets," Albayrak added. Suggesting that the most prominent cause of this fluctuation is because the U.S. is including its strategic ally Turkey in trade wars it is trying to carry out, Albayrak said they regard the targeting of the Turkish lira as a temporary situation, although it creates uneasiness among investors. He also stressed that the Turkish economy has the power to resist these and other attempts with its powerful infrastructure and effective instruments. "With our financial and economic instruments, we have taken the necessary steps to rule out this attempt and have begun to see its consequences. In the ongoing process, we will fully restrain the uneasiness with the reassuring movements needed by the market and continue to strengthen our path," Albayrak said. He recalled that since they took office, they have chosen direct communication both with domestic and international stakeholders and actors, noting the importance of reflecting Turkey's short-medium-long term economic perspective within a transparent process. "We have shared with investors the fact that Turkey still has a safe economic climate for international direct investments, as it has been for the past 16 years. The intense demand for the teleconference with over 6,000 investors is another indication of how important the market is for foreign investments," Albayrak continued. "Real market actors are not interested in artificial agendas or the perspective trying to be created, but they are curious about the economic approach that Turkey will adopt in the new period. We communicated our messages at this point, answered the questions and shared our general framework. As soon as we commission the phases of the new economic era, we will witness that the international investors' appetite for our country will continue to increase. With our multidimensional economy program, Turkey will continue to increase its confidence in investors." Highlighting that the world is experiencing a multipolar transition period in which the distribution of economic and political power undergoes radical changes, meaning a global and very comprehensive transformation process, Albayrak said undoubtedly this situation brings along pain. He also added that those who resist this change adopt conservative economic policies in order to keep the advantages they have. He emphasized that with strong financial bases and a secure investment climate, where they plan to have the highest level of competitive power in international markets and prioritize value added, strategic and technological product production, the new Turkish economy will quickly step into the transition process and become the most important pillar of tomorrow's powerful Turkey. "The processes we experience teaches us so many different things. In the global system, we need to be vigilant in every sense as a country. In the economy, markets can now be moved with a single statement or a tweet," he said. "Very significant mobilizations can take place about the countries. In the economy, we are now in a state of constant vigilance with all institutions and markets. Your reflexes must be strong." The minister pointed out that these processes are as much an opportunity as they are a threat to the countries. "You have to build an economic and financial system with a much stronger architecture against fluctuations that may occur. We are taking very different lessons from these processes. We see this process as an opportunity for Turkey's economy, financial architecture and system to change, transform and have a much stronger structure," Albayrak added. "We are facing a global process, rather than a situation that is unique to Turkey," he said. "We work day and night to emerge stronger from this process by establishing effective and reasonable communication with all stakeholders. We have stated since the first day we took office that we will determine our economic vision and policies to be implemented by consulting with all stakeholders in the economy, and by mutual sharing. We have made efforts to create a road map taking into account the opinions, accumulations and expectations of all stakeholders, from the business world to economists, from academicians to press members." Albayrak said that they set the most basic feature of the new economy approach as "participatory-inclusive" in this regard, adding that following all this sharing and dialogue process, they shared their approach to the new economy, which will form the roof of their short-medium-long-term economic policies, with the public. Underlining that together with a stable and participatory approach, they will apply an economic management style that can produce structural solutions rather than temporary solutions to the problems encountered, meaning "strategic" rather than "tactical." Albayrak said a strong fight against inflation will be at the core of their strategies to ensure economic equilibrium. He suggested that they will pass on the measures to reduce the current deficit without compromising on the fiscal discipline, take all necessary steps to improve the trust environment and enhance the appeal of the business and investment environment, as well as deepen and develop capital markets and realize a series of applications that will ensure resource diversity in public borrowing. Albayrak said one of the most fundamental dynamics of this process is the efficient use of public resources and the savings and productivity to be achieved, emphasizing that they will push for the unity of the policies called "stable growth," another phase of the model to be completed in 2019. "You need a very strong coordination while realizing these strategies. Monetary policy is not enough on its own in fighting with inflation. We will support the central bank with financial policies. With this support, we will expand the movement area of the central bank and do our part as expected," he concluded.